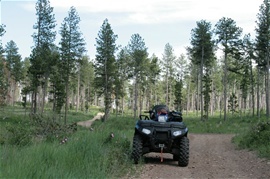 If you plan to ride on the Black Hills Forest trail system you will need a 2014 USFS Black Hills Trail Permit. We suggust you just get an annual permit since it is only costs $5 more than a temporary permit. 1. ATVs and UTVs must have a horn, a rear view mirror and be at least 250 cc in engine displacement. 4. Only one permit per vehicle per year may be issued.